Every TV show needs a hook: American Idol had wretched singers embarrassing themselves at auditions. The Walking Dead has cast members dying under increasingly unpleasant circumstances. Family Matters had Steve Urkel. 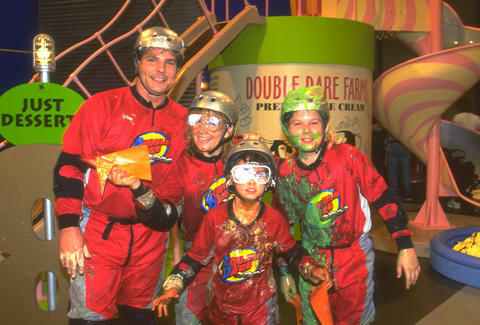 And Double Dare had its obstacle course. From 1987 to 1993, Double Dare ran roughshod across children's cable, drenching contestants in viscous substances of myriad colors and textures. Each episode -- whether an edition of "Super Sloppy," "Family," or proper Double Dare -- concluded with a 60-second relay race within an oversized Mouse Trap board. The madmen in charge doled out rewards of escalating monetary value for each of the eight obstacles cleared. Only a contender's resistance to all things slippery determined the difference between a grand-prize victory or a lesser prize-winning failure. For the show's 30th anniversary special airing Wednesday, November 23rd at 9pm on Nick at Nite, we've ranked our favorite tasks from Double Dare's gooey, gakky inventory of obstructions. Though there's nothing fancy about scrounging up a flag concealed by a colossal faux diner entrée, the Blue-Plate Special's many iterations stand as the obstacle course's only universal wish-fulfillment objects. Who among us has never yearned for buttery waffles large enough to feed a trailer park? Only those who hate waffles, and there's something fundamentally broken about people who hate waffles. To keep the miserable anti-waffle demographic happy, several other giant breakfast and lunch staples -- including pancakes and PB&Js -- found their way onto Double Dare's natatorium floor. Plenty of Double Dare's segments required its competitors to live out a transgressive scenario. But to survive Doggie Door, kids had to break not one, but two standard family homestead rules. Our moms and dads sneered at our desires to splash around in crud. Many parents also had conniptions and rushed us to the hospital after catching us eating out of Fido's bowl. Instead, watching other kids muddle through Doggie Door offered sweet, vicarious vindication. Thanks to the prop department's simplicity verging on laziness, The Tank was limited only by its whimsical and budgetary constraints. On different occasions, contestants waded through Styrofoam peanuts, Jell-O, and, in one infamous instance, baked beans. Inevitable soaked shoes made whatever obstacles remained all the trickier to navigate, so while it was hardly physically or mentally challenging, The Tank really sucked. Oddly enough, when overprotective parents complained about Double Dare's alleged antisocial messages, they fussed about depictions of kids having fun while wasting food. But they ignored the show's glorification of intentional tricycle crashes. In Brick Wall -- a modified version of an obstacle dubbed Icy Trike -- players awkwardly glided themselves and a trike through a stack of foam bricks mortared with whipped cream. In a roundabout way, Brick Wall validates Double Dare's philosophy against talking down to the audience: Kids weren't stupid enough to try this at home, which we know via the lack of Brick Wall-related lawsuits. When asked to lend us his wisdom, Marc Summers himself advocated for Gum Drop -- essentially a slide and ball pit conflation presented as an old-school gumball machine. In theory, a participant could let the flag slip from their hands while flailing through the avalanche of multi-hued spheres. In practice, this one was damn near impossible to botch. But if the cabal behind Double Dare designed Gum Drop as a jumping-off point that gifted players with a snazzy, idiot-proof objective, the contraption fulfilled its purpose with gusto. The deceptively treacherous Sundae Slide sometimes served as the omega obstacle. In such cases, contestants who managed to ascend its pudding-slicked incline saw promises of a Brand New Car, free enrollment at US Space Camp, or an equivalent bounty waiting at the depths of its spiral. But those who thought themselves home free after they made it up the ramp invited overconfidence to bring about their downfalls. The real tricky part about the Sundae Slide was finding swift sure-footedness in a kiddie pool full of whipped cream. In another universe, it could've been a plot of a horror film: The host, chuckling at this ghastly display, forces children to squeeze through the tiniest orifice of a human skull. His victims muddle past rotting brain matter and gobs of festering ear wax, then emerge, physically and emotionally tainted, out the opposite side. For these efforts, which have cost them their sanity and immortal souls, the host awards them a Lonestar Singalodeon. As much as the mess factor is emphasized in conversations about Double Dare, some of the obstacles required good ol' fashioned athletic bona fides (see: the Monkey Bars, the Tarzan Vine, and Lake Double Dare). But they all lacked the theatrical weirdness of the 1-Ton Human Hamster Wheel, which could only be conquered via six seconds of focused power-walking, and gave players a taste of the Sisyphean turmoil their pet rodents endured on a daily basis. If TV shows had souls, Double Dare's would resemble a nose and attached sunglasses fit for the face of world devourer Galactus. 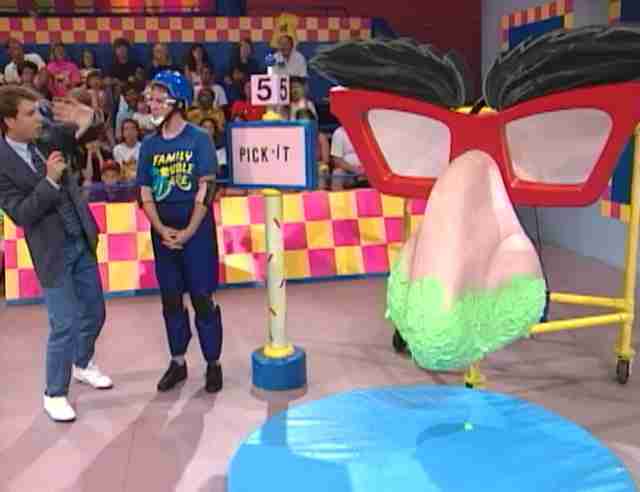 Not only was Pick It one of Double Dare's most visually striking set pieces, more than a handful of quests for the grand prize fell short somewhere up those monolithic nostrils. But even if contestants failed to locate the flag concealed under layers of simulated snot, at least they don't have to go to their graves regretting never having picked a monstrous schnoz on national television. Barry Thompson's work has also appeared in Paste, Esquire.com, the Boston Phoenix, and several other publications of varying degrees of repute. He tweets @barelytomson.